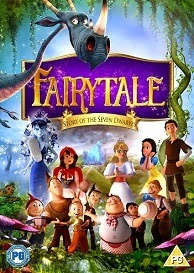 When Bobo, the youngest of the infamous seven dwarves, accidentally pricks Sleeping Beauty with a needle which sends the kingdom into a century-long slumber, he and the other six dwarves must embark on the adventure of a lifetime – to find her one true love and undo the Snow Queen’s wicked spell! A hilarious mash-up of everyone’s favourite fairy tales and a story for young and old alike, this adventure has everything from tap-dancing dragons to brave little dwarves, a romance between Sleeping Beauty and Jack (of ‘the Beanstalk’ fame), non-stop gags, and toe-tapping songs. Love Shrek? Then you’ll be Enchanted by FAIRYTALE: STORY OF THE SEVEN DWARVES – the mother of all family films!